Reduce the adverse per capita environmental impact of cities, including by paying special attention to air quality. In 2015, the daily drinking water production was 823 litres per person on the island of Montréal, 26% pless than in 2001. This is noteworthy, as Quebec’s potable water savings goal in its Stratégie québécoise d’économie d’eau potable was 20% for 2017. The Montréal community’s greenhouse gas emissions (GHG) were reduced by 25% between 1990 and 2013. This is in line with the objective to achieve a 30% reduction in emissions by 2020. However, GHG emissions by the transport sector (road transport more specifi cally) rose 14% between 1990 and 2013. The number of days with poor air quality from 64 days in 2015 to 29 in 2016. Between 2015 and 2016, the number of days with poor air quality in Montréal fell 60%, from 64 to 29 days. This was the best result since 2002 when air quality data started being collected. In children, exposure to tobacco smoke is responsible for 13% of life-long asthma, 7% of respiratory infections and 6% of seasonal rhinitis (hay fever). In Greater Montréal, in 2013–2014, 12.3% of youth aged 12–19 stated being exposed to second-hand smoke at home. This rate was 5.9% in Toronto and 4.3% in Vancouver. A survey of 1,600 households on the island of Montréal revealed that one dwelling out of fi ve presents traces of visible mold or water infi ltration or odors from mildew. This proportion jumps to 38%, when humidity and non-visible mold are included. Renter households, single-parent families and couples with children are more likely to be affected by this issue. In 2011 and in general, 77% of Montréal’s boroughs had a “medium-high” to “high” pedestrian potential, as did 64% of Laval’s neighborhoods. A neighbourhood’s pedestrian potential considers the area’s intersection, residential and destination densities, as well as its land-use mix. Pedestrian potential is rated on a four-point scale: low, average, medium-high or high. In Montréal and Laval, the pedestrian potential is higher in disadvantaged neighborhoods compared to more advantaged neighborhoods. In 2011, more than 90% of Montréal children under 18 lived in a sector whose central point was less than one kilometre away from a park or green space and approximately 40% lived in a sector whose central point was less than one kilometre away from a sports or leisure infrastructure. Little difference was found in access between children living in advantaged areas and those living in disadvantaged areas. In Laval, the percentage of children under 18 living less than one kilometre away from a sports or leisure infrastructure varied between 53% in disadvantaged neighbourhoods and 82% in more advantaged neighborhoods. En 2012, 53% of public schools in the Montréal socio-sanitary region (SSR) were within a 500-metre radius (10-minute walk) of a fast-food restaurant and 74% of schools were within a 500-metre radius of a convenience store. These are the highest percentages in Quebec. In Montérégie, these percentages were 37% pour la proximité d’un restaurant-minute et 49% for proximity to fast-food and 41% and 44%, respectively. Montréal schools are also notable for their proximity to bike paths and for the pedestrian potential of the neighbourhoods: in 2012, 65% of public schools in Montréal were within a 500-metre radius of a bike path and 84% were in a neighbourhood with a “high” pedestrian potential. These percentages are the highest in Quebec. The percentage of schools located within a 500-metre radius of a bike path were 24% in Montérégie and 30% in Laval. Between 1998 and 2013, the number of elementary school children in Greater Montréal walking to school fell from 41% to 31%, while the number of children being driven jumped from 22% to 38%. 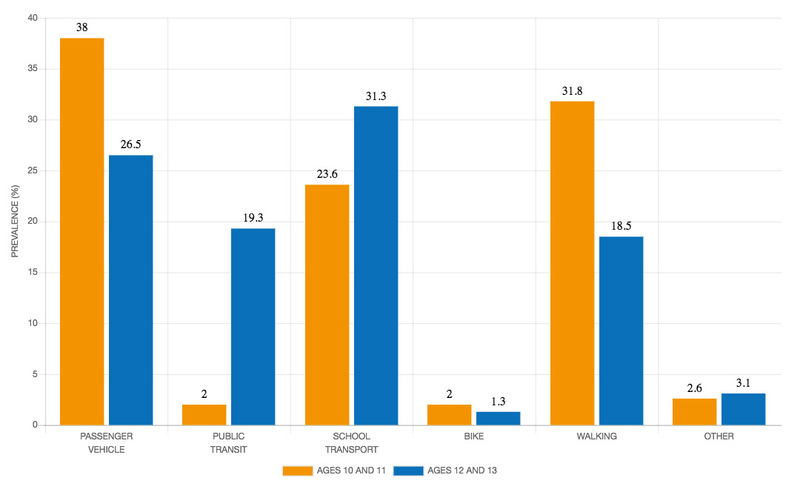 The proportion of 10- and 11-year-olds walking to school was 31.8% in 2013, in 2013 compared to 18.5% of 12- and 13-year-olds, the age at which they start high school (Figure 11.1). The proportion of 10- and 11-year-olds who were driven to school was 38% in 2013, compared to 26.5% of 12- and 13-year-olds. The most signifi cant difference involved public transit: only 2% of 10- and 11-year-olds used public transit in 2013 while 19.3% of 12- and 13-year-olds did. IN 2016, MONTRÉAL WAS NAMED ONE OF THE TOP NORTH AMERICAN CITIES FOR ACCESS TO PUBLIC TRANSPORTATION, RANKING FOURTH WITH A TRANSIT SCORE OF 77.4, AFTER TORONTO (78.1), SAN FRANCISCO (80.4) AND NEW YORK (84.1). The Transit Score is a composite index that assesses public transit accessibility and quality, and is rated on a scale of 0 to 100. The most recent data collected by Vélo Québec revealed that 78% of children in Montréal and 85% of children in Laval (ages 3–17) rode a bike in 2015. Over half of these biked at least once a week. SOURCE: Enquête Origine-Destination 2013, a special compilation by the Direction régionale de santé publique de Montréal. From 2011 to 2015, 6,308 children under 18 were injured or killed in a traffic accident involving a motor vehicle in Montréal, Laval and Montérégie (excluding on highways). 41% of collisions causing injury or death on the Greater Montréal road network occurred on the island of Montréal.